Product information "AOETEC - Nano Shutter"
Close your motorized windows automatically if it starts raining or shut down your shades if it is to warm outside. 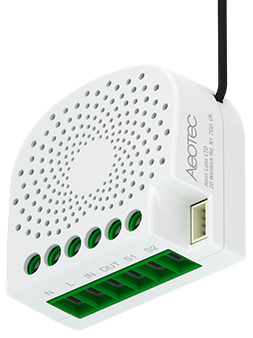 The Aeotec Nano Shutter enables you to control a broad selection of devices wirelessly and intelligently. The module equips motors for shutters, shades, garage doors, venetian blinds, etc. with Z-Wave technology. Thus, shutters and venetian blinds can be controlled both wirelessly via Z-Wave commands and locally via the connected conventional wall switch. The Aeotec Nano Shutter is designed to be mounted inside a flush mounting box, hidden behind a conventional wall switch. Related links to "AOETEC - Nano Shutter"